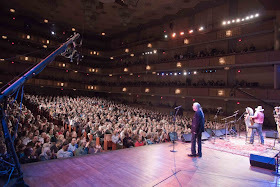 Former Teamster Joel Rafael wowed a sold-out audience at the Kennedy Center Sunday night with a stirring performance of Woody Guthrie's "Ramblin' Reckless Hobo." Rafael once worked as a Teamster concert grunt at the San Diego Wild Animal Park. Last night in the nation's capital he shared the stage with Jackson Browne, John Mellencamp, Roseanne Cash, Lucinda Williams, Ramblin' Jack Elliot, Ry Cooder, Judy Collins, Donovan and Guthrie's daughter Nora. It was a grand celebration of Guthrie's 100th birthday. And it was a reminder that working people share the same longings and face the same trials now that they did during the Dust Bowl. Rafael at the Kennedy Center on Sunday. The artists brought to life (though they were never dead) Guthrie's songs about love, poverty, greed, solidarity, homelessness and hope. The songs express the pride and aspirations of ordinary Americans. During last year's uprising in Wisconsin, "This Land Is Your Land" was a spontaneous favorite of the protesters at the state Capitol. We fear the message of that great song was lost on some of the affluent Baby Boomers in the audience, who may view it as the quaint soundtrack to a PBS Pledge Week special. The war on workers still rages. Guthrie's songs still count. One of the first songs John Mellencamp ever learned to play rings truer than ever: "If you ain't got the do re mi, boys, you ain't got the do re mi." He played it last night. The lyrics to "Union Maid" -- "You can't scare me, I'm sticking to the union" -- mean something important to workers under attack by predatory corporations and their political puppets. The Old Crow Medicine Show performed a rousing version. Ramblin' Jack Elliott's solo "1913 Massacre" reminded us that people sacrificed and died for the right to join a union. And was there ever a more pointed indictment of Wall Street than Rosanne Cash's crystal clear delivery of the final words to "Pretty Boy Floyd": "You won't never see an outlaw/Drive a family from their home?" Two days before the show, Rafael, his wife Lauren, and his band toured the International Brotherhood of Teamsters headquarters. They studied the historical photos and artifacts displayed throughout the building. They were delighted to take business cards that read "James P. Hoffa." Radoslav Lorkovic played piano and accordion during the Guthrie concert. 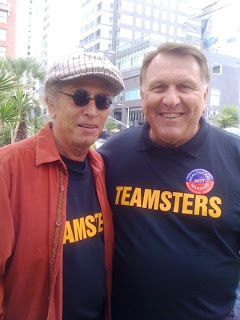 After the concert he said he appreciated the tour of the Teamsters building. His family had been miners. It was very moving, he said.